“In the Philharmonic word, we can already easily imagine the love of harmony. 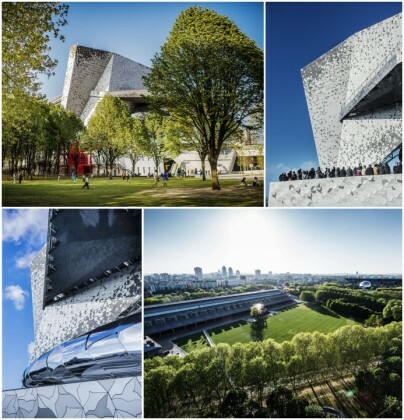 “For Jean Nouvel, to whom we owe the futuristic architecture of the new hall of Paris shows, the maintenance building of peaceful relations with its environment. Harmony with the light of Paris thanks to the architecture of reflections measured and compounds, created by a quiet relief evidenced by the graphics drawn by the cobblestones of cast aluminum. Harmony with the Parc de la Villette with the horizontal shelter garden under construction, punctuation follies, reflections in the shadows shine. Harmony with City of Music by drawing oblique planes, tilings lines of force. And even harmony with the ring road and nearby suburbs by creating a dynamic and distant view, a sign of light at night.